The new game Granny Smith for Android landed on Google Play Store. Granny Smith is a fast paced racing game filled with amazing stunts, Jump, glide, swing and spectacular crashes. The game story is very simple, Granny Smith loves her apples but a thief is stealing the app from her garden. Now you’ve to help old Granny to get the apples before the thief does. During this chase, Granny skates through farmland, cityscapes, barns and Offices. The game is simple but funny and suitable for all ages. I’m sure you’ll be addicted to the game after two three levels. Currently the game has 36 different levels. 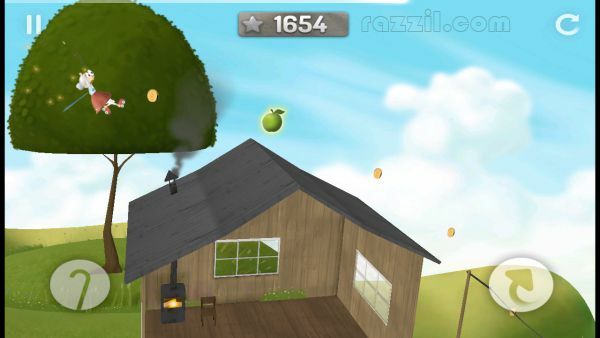 Spectacular physics – Granny Smith uses some of the most advanced destruction physics in mobile games. Crash through crates and windows and watch the pieces fly all over! Dazzling visuals – Zoom through dozens of vibrant, whimsical worlds! Each level is like a fanciful, three-dimensional storybook. Intuitive controls – Help Granny pull off crazy moves with simple two-button controls – perfect for both tablets and phones. Vintage replays – Watch your best runs in retro movie style with cool camera angles and slow-motion effects! Power Granny up – Collect coins and equip Granny with a helmet, banana peels and baseballs. If Granny is getting old, you have two alternative characters to play with – Scruffy and Stanley! The app requires Android 2.2 or greater and is available on Play Store for $.99 (Rs. 59.14).